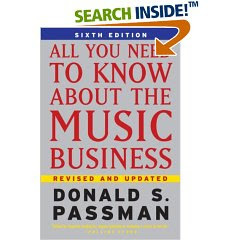 If you are serious about pursuing a career as a touring musician and/or a recording artist, All You Need To Know About the Music Business: 6th Edition by Donald S. Passman will be an invaluable resource. For those who have already gotten their feet wet as a public musician, this book will tie together a lot of the loose odds 'n ends of industry information undoubtedly picked up along the way. Bedroom musicians will probably be able to avoid a lot of hard knocks if they can understand the information presented. A close alternative reading to this book would be to get an undergraduate degree in the music industry, then go to law school, and finally become a music industry lawyer. Your undergrad education would be obsolete by then, but hey! you're a music lawyer - and music lawyers make all kinds of money, dealing in all sorts of contracts among record companies, music publishers, and musicians (et cetera). Unfortunately, music lawyers don't have much time being musicians.